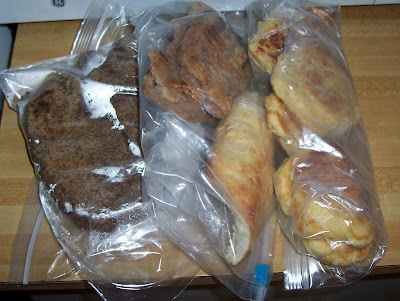 Before going camping, put the dry ingredients together in a plastic bag and shake them together. 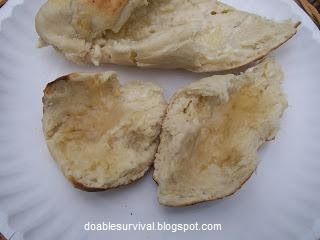 When you are ready to cook the bread, add the water and oil/butter. You can add berries, cinnamon, brown sugar, raisins, or whatever you would like. I start with 1/3 cup of water and then add a little extra if needed. 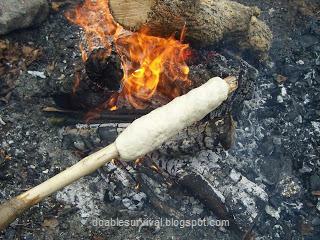 If you can temper the stick in the fire first (make it hot), it will help cook the inside faster. 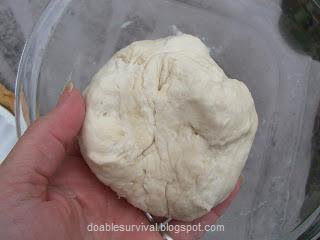 You want the dough to be firm enough that it won't sag once you wrap it around the stick. 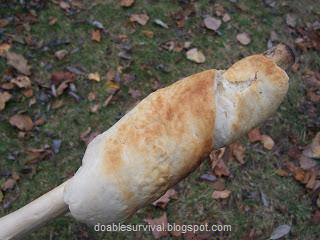 Roll the dough between your hands to make kind of a snake shape, and then wrap it around the stick so it is 1/2 inch thick or less. This is fun for kids to do camping. Try to put it above the fire where you can hold your hand for about 10-15 seconds before it gets too hot. I personally just guesstimate and hold it over the fire. You can tell by the color if it is too close; and if it is too far away, it will just take a little longer. If you hold it too close to the fire, the outside will cook too fast and the inside will be doughy. It's pretty easy to get the hang of. It will cook in about 10-15 minutes, depending on how close you hold it. 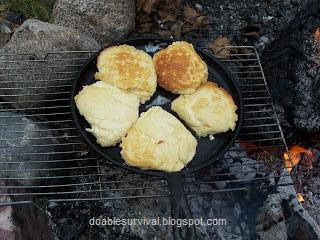 There is just something special about making food from scratch over a campfire in the great outdoors. Mmmmm I wish you could smell this! I put a little butter and honey on it. Yum! 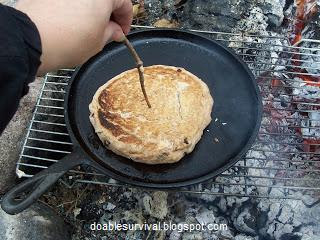 This is actually the first time I've cooked in a pan over a campfire, so this was a learning experience for me too. Press the dough into a warmed pan with oil in it. (I shape it in my hands first.) Make sure the pan isn't directly over flames or it will burn. Press it so it is about an inch thick or less. Keep in mind, it will rise a little. 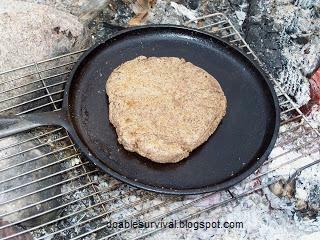 When it has cooked so that it is firm enough to flip it, flip it over every few minutes to check it and cook it evenly. You can poke a stick or toothpick into it to see if it is done. If it is not done, the dough will stick it. I used my cast iron pancake pan that I love. 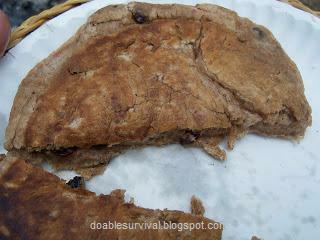 I decided to try it with 1 tsp cinnamon, 2 tbsp brown sugar, and raisins like I saw in one version. 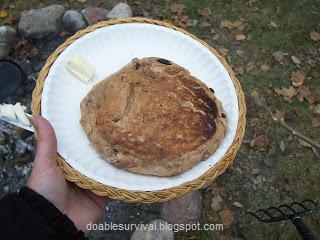 I'm not sure I would actually call this Bannock bread but it is very good. Light and fluffy. Mix the ingredients together. It's softer, so I just put dollops of it in the pan with a spoon. I had a paper plate with some flour on it for handling the dough today, and I just patted them flatter. These rise as they cook, so they will get thicker. Ok, let's say you have just a little flour... no salt, no baking soda... nuttin'... but nuts! Acorn Flour Bannock Bread! 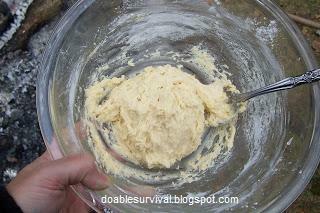 Just substitute acorn flour for 1/2 the regular flour. Yeah, I cheated and added the other ingredients, but it is doable. Did you know you can make flour from things like cattails? I'll touch on that later. 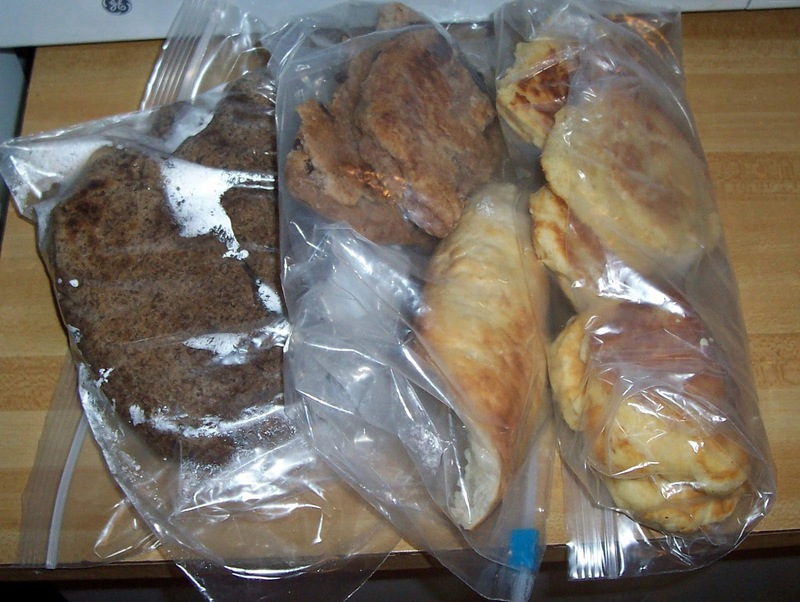 PS, Ok, who is going to help me eat all this leftover bread I made today?! Coming soon.... my own (thorough) home trials of OxyClean, the home-made version, and the dollar store version (if they have it here). Which one really work better and is it really cheaper to make your own? I think this would be fun to try with my nieces next summer! Great blog-well done and easy to understand! Loved it, so easy to follow your instructions. Great post, thank you. 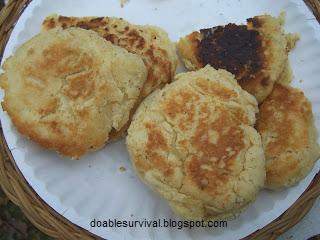 Would you mind if I used your photos (with credit and link to your blog of course) on my own blog post about bannock? 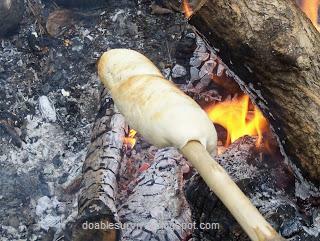 We were having so much fun making our bannock we didn't get any photos of bannock on a stick. I'm at www.gettystewart.com. That's fine. Glad you had fun with it. 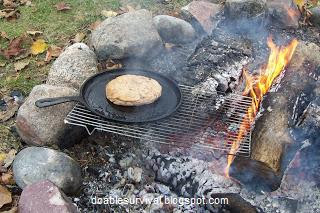 :) I made some over the fire last week too. Super duper, thanks Cilla Lilly!